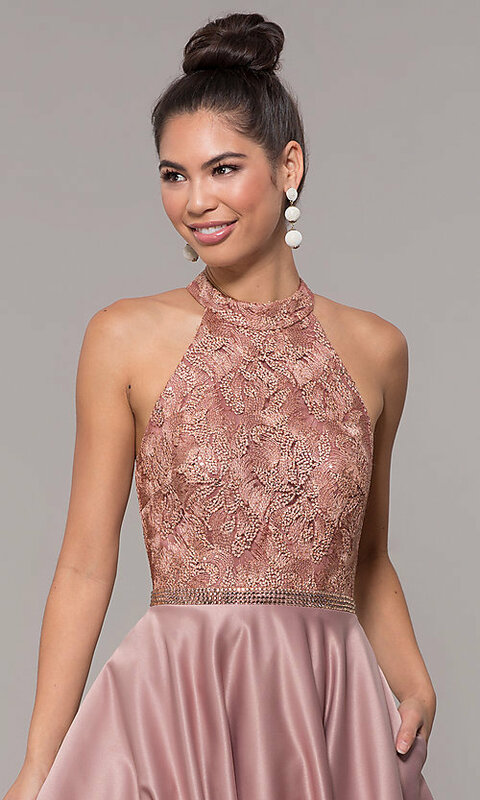 Wear this ball-gown-style formal prom dress to stand out at prom 2019, a military ball, or another special occasion. This long poofy prom dress features a beautifully embroidered halter-style bodice. A rhinestone band cinches the waist, and the full floor-length skirt features stylish pockets for added convenience and flair. The fashionable high-neck racer front joins a circular collar and fastens as a halter at the nape of the neck. There, straps fan out in a sunburst pattern and criss cross the open back of the gorgeous prom dress. Affordable at under $200, this ball-gown-style poofy formal prom dress will attract attention without breaking the bank. The model wearing cappuccino is 5'7" and wearing 6" heels.